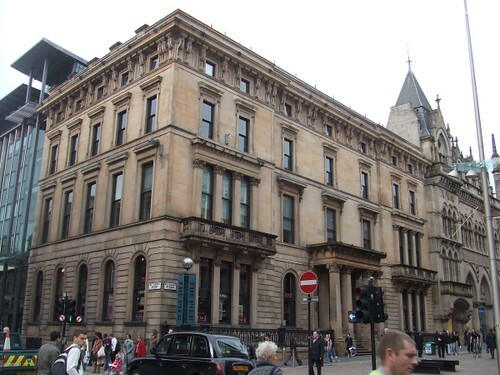 This nice looking building located in Buchanan Street is currently occupied by The Pier. Not a great store although I may be biased. However according to Surviving Cinema’s from next July it will be the location of Apple’s first Scottish store. Class! My bank account is in fear for it’s life. A new update to WordPress is available today with over 50 fixes, mostly bugs. This is a small step towards the bigger upgrade that will be 2.1. As usual take a backup before proceeding of both files and the database. Today’s update was the first time I had to depend on the backup after I messed up during the update of a directory (so that’s what replace means). I also took the opportunity to move to a new theme – Unsleepable. I liked the simplicity and while I was at it I reduced the posts displayed down to a more manageable number. I don’t have much design skills but this may be my last off the shelf theme in that I might start to hack my own css together in future. Maybe. Lik-Sang is a well known Hong Kong company specialising in the import games market. For the last year they have been fighting a legal battle with Sony who were opposed to their importing of PSP’s. Last Friday a judge in the UK found against Lik-Sang and due to the possibility of other legal cases being raised Lik-Sang have decided to close. Import PSP’s and games could be had cheaper from Hong Kong, including shipment than buying from a UK high street. While Sony is protecting the PSP’s (shrinking) market it also smells of further PS3 delays for Europe and a potentially high cost for games. Rumours are of Â£60 & Â£70 price point for PS3 releases which is taking the urine. Talk about the big boys bullying the small firms! Lik-Sang did have one parting shot, pointing out the Sony exec’s in the UK that had enjoyed their import service. Furthermore, Sony have failed to disclose to the London High Court that not only the world wide gaming community in more than 100 countries relied on Lik-Sang for their gaming needs, but also Sony Europe’s very own top directors repeatedly got their Sony PSP hard or software imports in nicely packed Lik-Sang parcels with free Lik-Sang Mugs or Lik-Sang Badge Holders, starting just two days after Japan’s official release, as early as 14th of December 2004 (more than nine months earlier than the legal action). The list of PSP related Sony Europe orders reads like the who’s who of the videogames industry, and includes Ray Maguire (Managing Director, Sony Computer Entertainment Europe Ltd), Alan Duncan (UK Marketing Director, Sony Computer Entertainment Europe Ltd), Chris Sorrell (Creative Director, Sony Computer Entertainment Europe Ltd), Rob Parkin (Development Director, Sony Computer Entertainment Europe Limited), just to name a few. Goodbye Lik-Sang – a reliable company providing a good service to the UK and Europe that will be missed. Yet another proud day for Sony. Switching to Mac was made easier knowing that Boot Camp or Parallels were available so that Windows would never be far away for those 3 or 4 apps that do not exist on Mac that I need to run. However both take different approaches – which one to choose? Parallels is virtualization software that creates a virtual machine into which you can install Windows XP – Windows 3.1, various flavours of Linux, Solaris and even RC1 of Vista. Once you select your guest O/S you then install the O/S using your own media as you would on a normal machine. It’s easy to have many virtual machines and makes backing up fairly trivial – all can be done fromm the Mac without the need to reboot. Installing XP and Vista worked well and installing the included Parallels Tools meant that it was easy to share files through a shared folder and also your mouse would move seamlessly from the different environments without having to press keyboard commands to kick out of each window. Boot Camp takes a different approach, allowing you to install Windows XP SP2 using a drivers disk that is downloaded from Apple and allowing you to swap at boot between OS X and Windows XP. Only a Windows disk that has SP2 files on it is supported so you may have to slipstream an original disk to get a working cd. Once you’ve burned the Apple driver disk you create a partition using an easy to follow gui, insert your Windows disk and the Mac will reboot into the Windows install. Install XP as normal and after a couple of reboots you have a working Windows. Installing the drivers will give you a Windows that supports the iMac’s built in Bluetooth, iSight, graphics card and sound. Cost – it’s free and will be incorporated in Leopard. I loved Parallels. Having that much flexibility without having to reboot was a joy. Firing up Visio to finish off some work in XP while iTunes ran on the Mac with Flock running in the background was superb. I also had no crashes during my time with Parallels. I didn’t like hacking with USB files though and I would still consider USB unstable with the latest Parallels release candidate. Boot Camp while not without issues has performed well. Fast, great XP support, all my hardware now supported and easy to swap between OS X and XP via a reboot. To be honest the reboot was always my issue with Boot Camp but I need access to XP probably at most once a week so I can live with the reboot. The other issue with Parallels is paying $80 now when in spring next year Leopard will have Boot Camp built in. As I’m unclear just what Leopard will offer I’m not prepared to buy Parallels now – I’ll stick with Boot Camp. As a test I ran Company of Heroes under Boot Camp. One of the latest PC games it plays like a dream and on my iMac looked superb while keeping good speed (this was at 1920*1200 although I don’t think all the nice effects were on). If gaming is your thing Boot Camp is the only answer. If multiple OS’s are your thing then it’s Parallels. If it’s infrequent access to Windows XP then save money and download Boot Camp.